My new favorite shoe! I have had foot surgery and continual plantar fasciitis that I try to keep at bay by buying the best shoes. The Ghost 11 is perfect. When Zappos had them on sale, I ended up buying 4 pairs because I always worry when the next "generation" of the shoe comes out thatit won't fit as well. I hike regularly and walk about five miles daily. They have prevented any plantar fasciitis flare-ups this summer. Highly recommend! 26 found this review helpful. I live in Ghost 10s and was eager to try the new Ghost 11. Well, they're OK, but some minor changes from the 10 are a deal breaker for me. I do not like the new thin flat laces. They're harder to lace smoothly and harder to keep from twisting around in the holes that are now round instead of oval which kept the old puffy laces nicely in place. Also, there is only one of the "Tongue Tied" loops at the top of the tongue. Brooks added one of those double-slotted things halfway down the tongue adding difficulty to lacing and not improving the tongue position overall. I much prefer the two loops at the top. 13 found this review helpful. I have had the Ghost 9, 10, & now 11. The 11's offer great support and comfort. They fit just like the previous pairs. I teach fitness classes and these provide everything I need. 10 found this review helpful. I think these may be even more comfortable than the Ghost 10. They have great cushion and are very light. They were comfortable from the moment I took them out of the box. I have a large foot (12W) and do wish there were more color options. I ordered two pair in different colors to be able to see them in person. I decided to keep the navy ones. I really wanted to like the coral/black ones, but don't like the black mesh overlay. I'm not a fan of black athletic shoes in general though. 9 found this review helpful. I have purchased Brooks in the past and like the look of these (white/black/fushia laces) to compare with a pair of Nike Air Max 90's. The Nike's won the comparison as they felt a bit more hugging of my foot and for the amount of walking I'll be doing the thicker sole cushions the ball of my foot better. I would have kept both shoes except I could tell that the Brooks had a weak spot at the front of the foot and like my other gym shoes, the toe would wear through quickly. I ordered these Ghost 11 women's size 11 because I love my Ghost 9's so much. They don't even seem like the same shoe anymore. They are very light but are structurally very different. The arch support isn't as good and the sides of the shoes are about an inch lower around the ankle and just don't off the support I need. They don't tie up securely at the top and hold my foot securely because they are lower on the top of the foot. I was really disappointed and had to return them. I wear a custom inserts and have found Brooks to work the best for me. (need a deep shoe to accommodate) I go up 1/2 size and Wide Width and it works perfect. I do wish Brooks made some funky shoe colors/patterns. I am not a pink/aqua person but bought these for comfort. 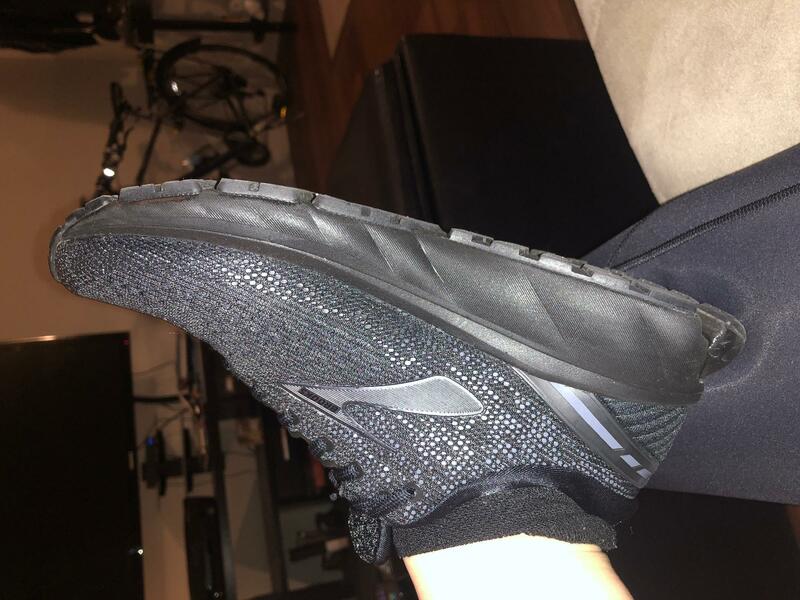 I can't really attest to the support as my insert takes the place of a lot of what the shoe does,however, I have tried many other shoes for style and Brooks offer the most comfort for me so there must be something to it. Since tearing the tendon in my arch last year, I am required to wear this hard, prescription, inserts in my running shoes. Therefore, I have to go up an entire size to fit these things in the running shoe. I can hardly believe this but I received my shoes this morning, have had them on for the past 6 hours, walked 5 miles and they feel amazing! Thanks to all the previous reviewers and to Zappo's I was able to make the right choice online! I love this shoe! I have a very high arch use orthodics & this has a removable insole. I have a wide ball & narrow heal & the wide is plenty wide & yet the heal is good for me too. They are very cushioned & I work on concrete floors so they are great! I used a sharpie and made the little bit of green black so they didn’t fight with some of my clothes I wear for work. I am a 7.5 with an orthodic & in these I bought the 8 & it’s good for me. GREAT shoe; thanks much for offering them!!! I have never tried a Brooks shoe before. They are amazing! I had no idea what a good shoe they are. I tried the Ghost 11 and the Ravenna 10. For me the Ravenna wins because the toe box is ever so slightly more rounded, where the Ghost 11 cuts a bit more sharp curve which will rub my smaller toes. I tried an 8.5W and they are awesome. I have a wide front and skinny heel. Great fit. I loved the Ghost too because they are a bit more cushy, but worry about the toe rubbing, but I do have wide feet. Both shoes were uber cloud like to walk on. This may just be my new go to athletic shoe. I tried the Ghost 11 pink/teal/black and they are really great looking. Love these Ghosts..I bought 2 colors! I am always an 8, but in brooks I always wear 8.5. Very cushioned insole. I have bad knees and these are very shock absorbing. I’m a walker, do 5 miles daily, I’m assuming they’d perform the same for a runner. The grey color is kind of silver and this pink color is bright but not neon. Lots of lace holes so you can customize the fit. These are the most comfortable sneakers I have ever owned. I have bunions and very few shoes feel comfortable but these do! Lots of toe room and very cushiony inside. They run small so I listened to the reviews and went up a half size to a 7.5. I usually wear a 7 in most shoes. I needed a comfortable shoe for walking and jogging and these are definitely it! Finally after trying several other brands, I found the right fit! Very happy customer! I wear a 10 in Asics because you are supposed to a half size up... but usually wear 9 1/2 in most shoes. In Brooks Ghost 11 I had to go up a 1/2 size too. Glad I ordered two sizes ... one is going back. Overall love the colors ! Comfty ! I wear a 9.5 in closed shoes but in brooks sneakers I always wear a size 10. My toe pushes up to the front of the shoe at 9.5 without any extra room. So i would recommend ordering a 1/2 size up. I walk 4-5 miles daily and these shoes are comfortable with good arch support and excellent shock absorption. Highly recommand. Brooks Ghost are my all time favorite running shoe. I tend to lose toenails due to excessive training and running for my half I participate in each year. I like Ghost because they have a much wider toe and always last a long time. *Big Tip: purchase a good pair of insoles and use them from the beginning to make these last even longer* only negative is the shoestrings are always too short for me to lace up each hole. I wish they were a hair longer. My mom was having a hard time with her feet and legs. She has neuropathy in her legs. These shoes have helped tremendously! Been wearing Brooks Ghost 9, Ghost 10, and now Ghost 11. The Ghost 11 is the best of all of them. They have the best support of all. And they seem to have more toe room. 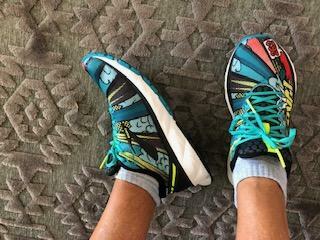 I don't usually write reviews, but I am really impressed with my first time purchase of Brooks running shoes and the Ghost 11. I always order running shoes for my walking because they seem to have more padding on the bottom for the front of my foot. I have wide feet and bunions, so the stretchiness and roominess of the front of the shoe is wonderful. The best part, though, is that walking in these shoes does not bother my knees at all! It must be the cushioning. I have loved my Saucony running shoes, but these are even better because my knees don't hurt when I do my three mile walk each day. Happy!! It was a narrow in the heel but wide in the toe box. I wore these for the first time this week to work. I had to facilitate a 7 hour workshop so I was on my feet the whole day. These shoes were comfy from the minute I put them on! I've been struggling with plantar fasciitis for about a year and when I researched good shoes for my condition, Brooks Ghost turned up in the feed. I've work the Ghost shoe over the years, but this one feels light and super comfy, even with my sensitive fee. I will they would offer some different color schemes. I have the grey and aqua blue and they are okay. So I'm back in the Brooks family and I couldn't be happier. As always, these Brooks Ghost shoes (my third pair) fit perfectly, have good arch support, and most importantly for me, seem to really cushion my walk, making it feel like there is a bit of "give" at every step. I have tried other shoes that fit as well, but don't have that feature, which significantly makes walking for long distances much easier on the feet, legs and back. Love the design of these as well - less color, which makes them more neutral, and thus more versatile, in my opinion. Nice sturdy shoes. Great support and fit on my average to wide feet. They look a tad clunky looking down at them but it may be just the white ones. Sleek from the front, sides and back though! Love them and all my other Brooks! To accommodate my bunions & hammer toe I traditionally go up 1/2 size in running shoes, unless a WIDE version is available. Such is the case in this purchase. I have total comfort in all aspects of the shoe. My feet are stable and cushioned on impact. Although I alternate these with others to extend life, they show minimal wear having put close to 100 ashphalt miles on them. I was prompted by the pop art graphic and apparently any one that notices inquires as to where I bought them. Good on you Zappo's. I loved the Ghost 10, but I think I like the 11 better overall. The toe box seems a tiny bit less roomy and a bit shorter than the 10, but the cushion is still solid and the overall shoe lighter. The toe box was still plenty roomy for my feet, but if you needed all the space in the 10, these may not work as well for you. I made a joke before a workout class - that the 11 is almost like the Ghost 10 and the Launch 5 had a baby. Still a good neutral, cushioned shoe, with less weight, but not as light as the Launch.